British horror films of the 70's were a strange animal. From the films of producer Richard Gordon to the outlandish flights of fancy that Hammer Films indulged in that decade, the 1970s saw many wild and unique films coming from the British Isles. However, few were wilder and weirder than Don Sharp's 1971 oddball classic, PSYCHOMANIA. 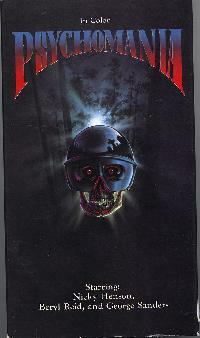 The film tells the tale of a motorcycle gang called the Living Dead, led by the antisocial Tom, played by Nicky Henson. Our hero Tom was raised by a rather odd pair-his mother (Beryl Reid), a medium who holds the secret of life after death, and the family butler Shadwell (George Sanders), who is also heavily into the occult and proves to be even more mysterious. Tom would do anything to obtain their occult secrets, including blackmailing his mother by threatening to wreak havoc on the roads with his gang! His mother finally relents, and gives him the key to a mysterious locked room in the house, which contains the secret of his father's death, and possibly much more.....Suffice to say, he uncovers the secret of life after death, and after a fun day of terrorizing the locals and leading the police on a wild chase through the countryside, Tom commits suicide in spectacular fashion by driving his bike through a guardrail and over a bridge. His girlfriend and gangmembers are left devastated, but what they don't realize is that Tom has the power to come back-the key to life after death is a suicide coupled with a willingness to leave your mortal state and come back as the living dead. Come back he does, in a wonderful scene showing him bursting out of his grave on his bike, revving the engine! His gangmembers are rather impressed by his return, and each duly commits suicide in hilarious fashion, and then returning from the dead to cause murder and mayhem as super, undead bikers! I won't go into more detail into the story as I don't want to ruin it, but it involves killing, chases, and a frog cult(!). This film is so over the top and strange, that star George Sanders reportedly killed himself after seeing it, due to embarassment!! Image Entertainment recently released this on DVD, and the quality is nice overall, with the exception of the first 20 minutes, which are a bit dark and murky. The sound is reproduced nicely, complementing John Cameron's cool and creepy score. This is a great film to see when you want to put your brain on cruise control and just enjoy a fun, trashy flick! See it today!